In this book, A.P.J. 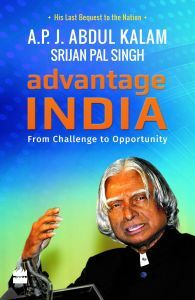 Abdul Kalam, writing with Srijan Pal Singh, draws upon examples ranging from entrepreneurship in places like Badshahnagar to a sophisticated missile programme like Agni to show how it can be Advantage India in the last lap of the journey to 2020 - the landmark year by which he had envisioned the country could transform into an economic power. How can the new initiatives - such as Make in India, Swachh Bharat, smart cities and skill development for the youth - be used to unleash the country's vast potential? Advantage India offers the answers. ushan and the nation's highest civilian award, the Bharat Ratna. Srijan Pal Singh is a gold medallist MBA holder from IIM Ahmedabad and a social entrepreneur involved in evolving sustainable development systems. He previously co-authored Target 3 Billion (2011) with Dr Kalam.